While “Headliners” wandered around the wonderful festival ground that is Las Vegas Motor Speedway on the last night of EDC20/EDLV, sources say flyers were being handed out which listed the lineup for Nocturnal Wonderland. This event will be taking place Labor Day Weekend (Sept. 2, 3, and 4) in San Bernardino. The event has a plethora of artists ranging from big-name headliners who are heading festival all over the world to artists that don’t always get the recognition they deserve. 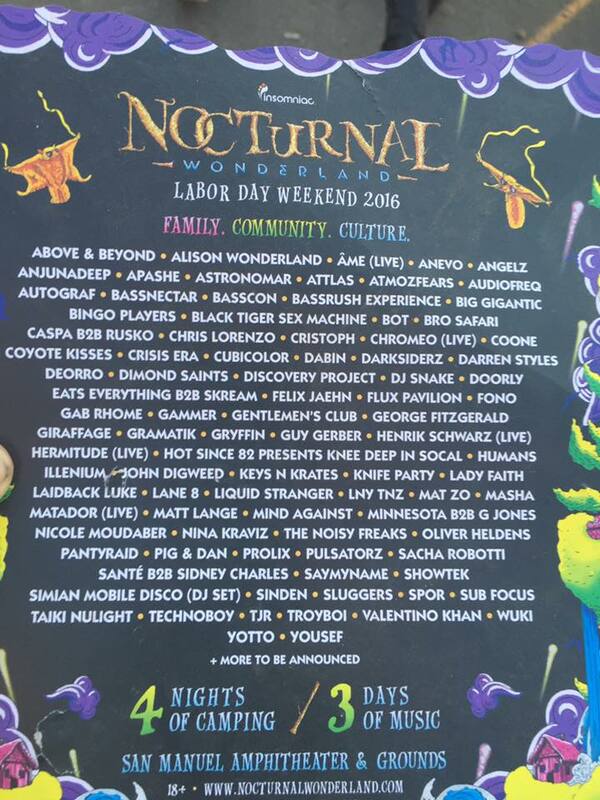 Nocturnal Wonderland is a 3-day music festival with four nights of camping. The event is 18 and older, so anyone wishing to buy General Admissions for the 3-Day pass can do so here. Anyone who wishes to buy the 3-Day VIP pass can make the purchase here. Below is a list of artists listed on the flier handed out at EDCLV.